On Monday, Sept. 17, 2018, SpaceX headquarters in Hawthorne, California held a live event. Elon Musk announced that Yusaku Maezawa, billionaire founder and CEO of the Japanese fashion retailer Zozo, would be the first private citizen to fly around the moon. This is a mission the company has planned for 2023. After joining SpaceX on stage, Maezawa said that he can finally announce that he has chosen to go to the moon. Maezawa, age 42, plans to invite six to eight artists to join him on his historic mission, which he calls the “Dear Moon” project. The idea came to him after he thought about seeing the moon up close and how it might affect some of his favorite artists. The artists Maezawa plans to take on his voyage to the moon have not been named. SpaceX says the mission should take about six days. The flight will be made aboard the Big Falcon Spaceship (BFS). The ship will launch from a booster named the Big Falcon Rocket (BFR). Both vehicles are still in the development process. The announcement reboots a similar mission SpaceX planned in 2017 to fly two private citizens around the moon on the Falcon Heavy rocket and Crew Dragon capsule. The flight was canceled because the company decided not to spend the resources having the Falcon Heavy certified safe for human flights. The flight will be a significant test of the 348-foot-tall rocket system that SpaceX hopes to use to fly 100 colonists at a time to Mars. In an effort to keep operating costs down, the BFR and BFS will be reusable. SpaceX will phase out the current rocket and capsule lineup completely. According to NBC News, SpaceX has a history of setting and failing to meet ambitious timelines. The Falcon Heavy rocket launched four year later than planned, while the crew capsule will have been delayed by five years when it sends the first crew of astronauts to the International Space Station in 2019. Laura Seward Forczyk, the founder of Atlanta-based space consulting firm Astralytical, stated before Monday’s announcement that the announcement is exciting, but people have heard it before. 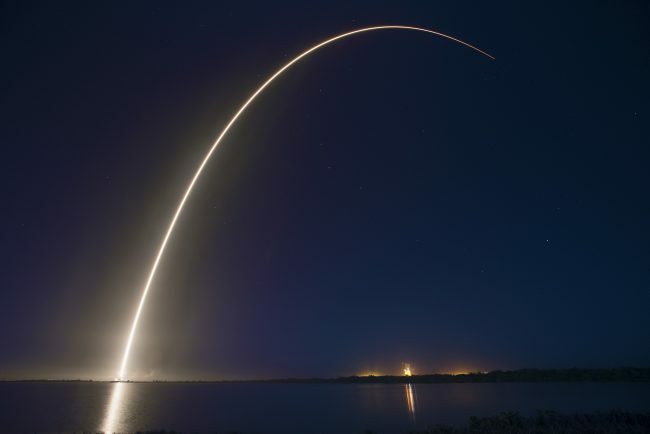 She noted that SpaceX could boost its credibility by releasing realistic price tags and development timelines. They could also benefit from showing the public the progress of its rocket system. The first test demonstration is anticipated for 2019, with a “short-hop” vertical launch and landing of the BFS at the SpaceX Brownsville, Texas, test site. SpaceX investor and private astronaut, Richard Garriott, who spent 11 days visiting the International Space Station, in 2008, said those who were aboard the spacecraft would experience the “overview effect” – a profound shift in perspective when seeing Earth from space.